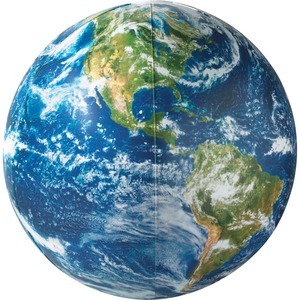 Inflatable globe features a digital mosaic of thousands of the latest satellite images from NASA to provide a lifelike view of our planet. This 16" diameter globe displays real cloud formations and glow-in-the-dark cities to let your children explore the planet. 16-page handbook includes games, activities, vital statistics about Earth and informational resources to guide your lessons.